No fashionista can forget their monthly dose of fashion news. May it be from fashion magazines, the internet, or twitter, one just cannot forget. You may not know, but I find all the fashion magazines (India ones) much far interesting than the ones from here (the USA). I know very odd and strange since I live here. India’s fashion industry just excites me so much! I eagerly wait for the 1st of every month, for new issues. 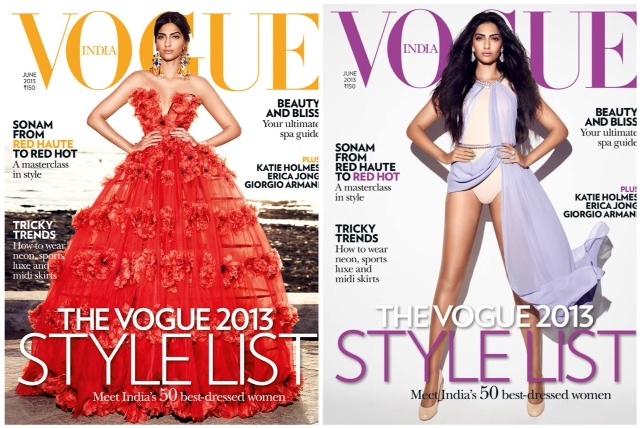 My favorite Sonam Kapoor is on the June cover of Vogue India dressed in ‘3D Flower’ organza gown by Alexander McQueen. Sonam looks gorgeous to me in anything she wears. Not only is she my fashion icon but one of India’s fashion icon that makes her presence in all parts of the world to any fashion show. And I know I’m a little late with this post, but I just started to blog again, so forgive me if you can!